If you’ve been on social media over the past week, you might have come across a video of an adorable bear cub trying its very best to climb to the top of a mountain. 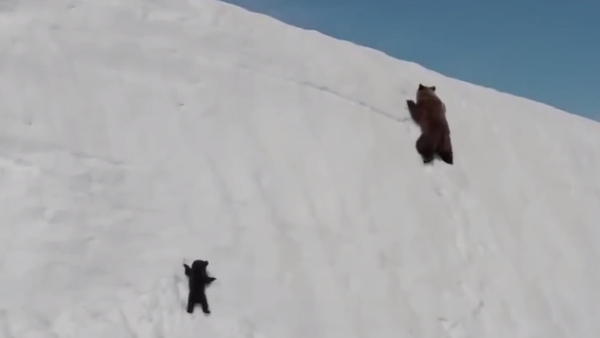 As seen in the clip below, which was made popular by media platform ViralHog, a baby bear is shown scaling a steep mountain with its mother, but its tiny paws prevent it from gripping onto the slippery snow. As a result, it repeatedly slides downwards. A few failures aren’t going to deter the cub, though, so it keeps trying until it catches up with its mother. “We could all learn a lesson from this baby bear: Look up and don’t give up,” tweeted Ziya Tong, author and board director at WWF Canada. The message seems apt for one of those inspirational posters displayed by just about every corporate wall, but as it turns out, things aren’t as cute as they seem. According to The Atlantic, biologists on Twitter were bothered by the footage, because it was clear to them that the mother and child had been escaping a drone. Nature lovers added that the mother would not have climbed the mountain if she hadn’t been shaken by a drone operator. Stop sharing that video of the baby bear climbing back up the mountain. Does it show perserverence? Yes, but as a extremely loud drone harasses both mother and baby. It shows unethical filming and the drone operator should be charged.